When a friend of mine returned from a trip to Turkey several years ago, she had been smitten by the country’s beauty, people, culture, and history. She could hardly wait to return the following year, planning a second tour with Bora Ozkok. 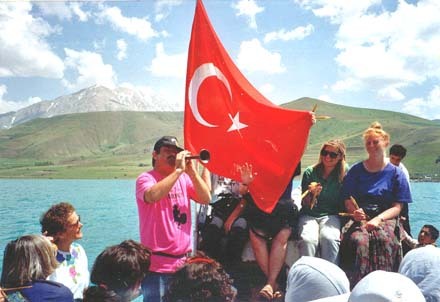 The founder of Cultural Folk Tours International, Bora is a world-renowned teacher of Turkish culture, music, folk dance and folklore, who personally leads many of his company’s tours. What was it about Bora’s trips that made them so special? And how does a “cultural” tour differ from other tours? After attending several of Bora’s lectures in various Southern California locations and speaking to dozens of his repeat customers, I decided to interview this dynamic Turk to find out. Ironically, when he was a young man, Bora Ozkok never dreamed he would wind up running his own tour company. Born in southern Turkey, Bora garnered an interest in history as a boy, when his mother took him to see some of the countless ruins that are peppered throughout the region. But it wasn’t scholarly pursuits that would dominate Bora’s early years. First and foremost, he was an athlete — a superb swimmer, who, at the age of 15, represented Turkey at the 1960 Olympics in Rome. He went on to tour with the national swim team, breaking records and winning events, like a 20-mile swim that he still recalls as one of the toughest things he’s ever accomplished. Bora came to the United States in 1964, when he was granted an athletic scholarship by the University of California at Berkeley. His major was architecture, but his heart was still focused on his athletic ambitions. He received numerous honors, such as being chosen as an “All American in Soccer” in 1967. Bora also received the Most Valuable Player Award and was selected as one of 12 outstanding foreign students in America, as well as the outstanding representative of Turkey from over 500 U. S. universities and colleges. It’s not surprising that the handsome, athletic Turk was popular with the ladies. On one occasion, a pretty college student asked him to join her at a folk dance. A bit reluctant at first, he gave it a try. Here was a young man with a variety of talents, who was also on a fast track towards either becoming an architect or a professional athlete. Instead, he took an unexpected turn and fell in love with folk dancing. And that was that! When he graduated from college, he became a teacher of international folk dancing. And like everything else he tackled, he gave it his all. After returning to his homeland to learn the ethnic songs and dances of villagers in various regions of the country, he taught Turkish folk dancing in the United States, Canada, and 20 other countries on four continents. 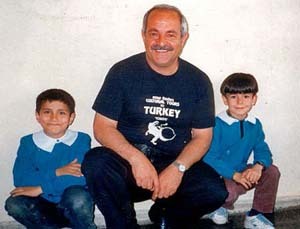 It was teaching folk dance courses that eventually led to taking small groups to Turkey, when enthusiastic students begged him to show them his homeland. Once again, Bora’s life changed direction. 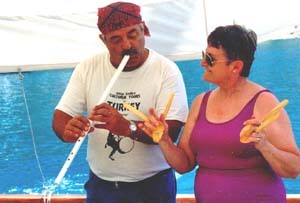 Establishing Cultural Folk Tours International Inc. almost exactly 30 years ago, Bora has never looked back. A natural outgrowth of Bora’s folk dancing was learning to play native instruments. He’s never had a formal lesson, nor does he know how to read music. Nevertheless, Bora plays more than 15 instruments, including the harmonica, banjo, recorder, Zurna (horn), Tulum (bagpipe), and Kaval (flute). Over the decades, Bora’s flute has become his trademark. He explained why he always takes his instrument on his tours. “As soon as I step off of the bus, I begin to play,” he said. “The people in these small towns are my friends, and when they hear me playing, they come to greet us.” Like a Pied Piper, Bora leads his tour group into the middle of town, often followed by children and local residents, who bring out their own drums and reed instruments to welcome the guests. And it doesn’t stop there. “When I see that the town is preparing for a wedding or some sort of party, then, by God, I’ll get us invited,” he added with a smile. He’s usually asked to play one of his instruments with the other musicians, often accompanying the local folk dancers at festivals. So this was the definition of a Cultural Tour. It’s a grassroots approach to tourism that goes well beyond the usual tourist tracks. Bora’s excursions reach into the heart and soul of his beloved country, straight to the traditions and culture of the native people. Of course, he takes his groups to popular spots, like Troy and Ephesus, and works with some of Turkey’s finest hotels and restaurants. But it’s the off-the-beaten track stuff that really sets his tours apart from — and above — the rest. Bora has recently added humanitarian efforts to his growing list of undertakings. A few years ago, he decided to give financial assistance to girls from the villages who wanted to go to high school. “Many Turkish families focus on their sons’ educations and often don’t have the money to send their daughters to school,” explained Bora. “Many of my regular clients — people who have gone to Turkey with me many times — have wished to help. So I match funds with whatever anyone wishes to donate; plus, I also donate my own money to help.” Again, I could see that this goodwill ambassador was going way beyond the call of duty when it came to doing things for his countrymen…and countrywomen. He gave six village girls scholarships for their high school education in 2006, and plans to do the same for more girls in the future. It’s obvious the man loves his profession, in spite of the ups and downs that come with changes in the world’s political climate. “I’ve never really worked for a living,” he said with a chuckle, meaning that his life has been about doing what he loves, instead of having a “normal” job. Not that he hasn’t worked his tail off in the process. He’s away from home most of the year, lecturing about Turkey and his tours all over America, or personally leading one of his wonderful excursions to his native land. 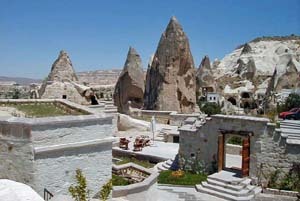 Not-to-be-missed for anyone going to Turkey is the other-worldly landscape of Cappadocia. The geological formations are often called “fairy chimneys,” a mystical reference to the upside-down cone shapes created through centuries of wind and rain erosion. Underground caves were carved into the rock over 1000 years ago by early Christians, who used them as churches, homes and even stables. 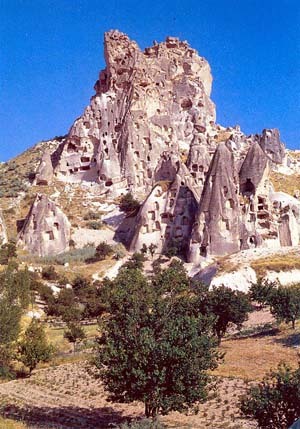 It’s easy to see why Cappadocia is considered as one of the Natural Wonders of the World. Besides the astonishing rock shapes and fascinating history of the region, villagers still dress in colorful attire and ride in horse carts. 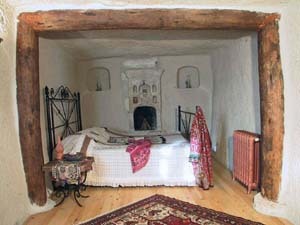 Tours of some of the caves in various parts of Cappadocia reveal ancient frescos and paintings created by the people who once lived in this underground city. 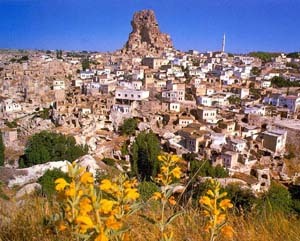 Cappadocia is Bora’s favorite place on earth. So when the opportunity to purchase a piece of this remarkable place for a hotel arose, he jumped at the chance. Teaming up with Turkish architects and builders, Bora designed his unusual hotel to include as many modern amenities as possible, while preserving the integrity of the original structures. 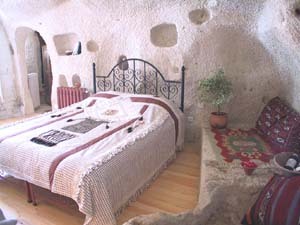 Simply put, the hotel, Capadoccia Cave Suites, is located in Göreme, Cappadocia and has the distinction of also being a Unesco World Heritage Site, is unlike any other place on earth where you’ll ever stay. 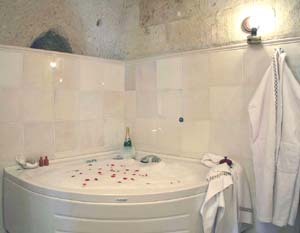 It consists of 18 rooms (including five suites with fireplaces), each with its own Jacuzzi tub and television. At the present time, another 12 rooms are being completed. 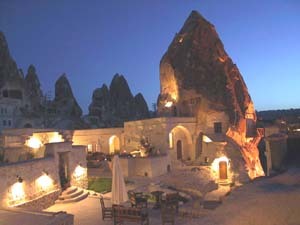 Like a proud father, Bora is happy to share the fact that the Cappadocia Cave Suites has received numerous awards. It has repeatedly been voted as one of the best boutique hotels in the world. Since 2005, the hotel has been rated 17th among the “101 Best Boutique Hotels in the World” by Abercrombie & Kent. In addition the Spanish Tourism Board ranked it as the best boutique hotel in Turkey. A natural communicator, Bora Ozkok uses his tours as a forum to teach his guests about Turkey’s past and present; its politics, religion, and history. The people who take his tours, visitors from all over the world, go home with an understanding of the “real” Turkey and a genuine fondness for the Turkish people. It all comes down to the reason so many of us travel: to learn and experience other people and cultures. That’s how prejudice and misunderstanding about other human beings and their beliefs and customs are eliminated. Perhaps now more than ever, we need to make an effort to visit Turkey, so we can come home with a deeper understanding of what these people are all about. Although Bora Ozkok plans to retire in two years, there’s still time to accompany him to Turkey in either 2007 or 2008. I, for one, plan to take as many of his trips as time and money allow.